I love a good romance, it doesn’t matter if it’s a historical or not. I love to be swept away in a good story line, so when Jessica asked me to feature her new book on my blog I said sure! I knew she wrote romance, so we were good to go. Boy was I surprised when to find out she also writes Young Adult Fantasy. This is way outside my realm of normal, but you know what? This book is AWESOME! This is the first book of Jessica’s I have read and I’m hooked. She is an amazing writer. I loved how she developed Gabby and Michael’s story. At the core of every love story there has to be a friendship, and Jessica showed us how to masterfully write a love story between two teenagers. I closed this book and asked the empty room, “WHERE IS BOOK 2? ?” It’s that good, people. Do you like time travel, creepy things that lurk in the shadows, alternate worlds, real people trying to work out the problems of the world? Well, then this book is for you. It’s a high paced action packed book and trust me you will not be able to put it down. Jessica was kind enough to be a guest on our blog today. Hello, Jessica! Welcome to suburbanthoughts! Please tell us about the characters and how you picture them. I love finding out how an author pictures a character. I feel like we are being let in on a secret. and put them where I’m writing. They serve as inspiration and also help me keep the physical descriptions consistent throughout the book. There are many sites that you can use to find images—modeling websites, stock photo sites, hair styling sites, and sales catalogues all work well, but my go-to is often image searches for actors, actresses, and musicians. Why do I choose famous people? Mostly because I’ve discovered it’s easier for someone to form a frame of reference if you equate your character’s looks to someone popular. The hero and heroine for Saving Yesterday have been clear in my head from the beginning, but oddly enough, both of them evolved as I wrote the story. Let’s start with the heroine, Gabby Creed. Gabby’s seventeen and has long, black hair. She’s petite and needed to be of Spanish descent. Though small, Gabby isn’t someone who can be shoved around. She possesses a quick wit and isn’t afraid to stand against opposition. Add to the mix that she’s trained in self-defense and is fiercely loyal to those she calls friends and finding a person that matched her became a tall order. I finally settled on a young Selena Gomez, but she never felt quite right. Selena’s smile is a little too sweet for Gabby. Then I sent my manuscript out to beta readers and one of my readers sent me a link to some pictures of Spanish actress Martha Higareda—we’d found Gabby. What do you think? Does she fit the description better? Now the hero. Dear, wonderful, Michael Pace. Michael’s a bit of a wounded hero—he’s selfless, but sometimes for the wrong reasons. He has dark hair, kind eyes, and a dimple that appears on only one cheek. When Gabby first sees him she can’t place his age because he looks like a mixture of man and boy. Michael’s lean, but packs a lot of strength at the same time. 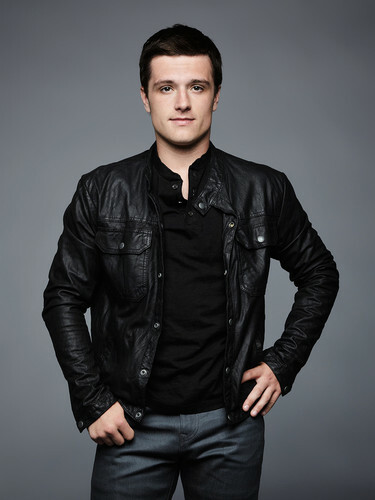 I knew right away that Michael could only ever be one actor for me—Josh Hutcherson (and this was BEFORE Hunger Games). Josh wasn’t exactly the person I had in my head either, but he was a very, very close fit and all the interviews I’d seen of JHutch (okay, I might be 30 but I’m a big fan!) he fit how Michael often acted. 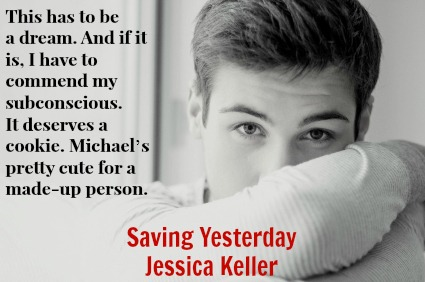 Then recently when I was pulling together promotional images for the release of Saving Yesterday, I stumbled upon the image below (I added the text) and low and behold Michael Pace was found. The young man in the photo might as well have walked right out of my brain. Seriously. What do you think? Do you like when authors can compare their characters to movie stars, or would you rather image the hero/heroine on your own? Leave a comment and be entered to win your own copy of this book! I will draw a name on Friday, March 7th. Congratulations, Nancy Barlass! You have won a copy of Saving Yesterday. I will drop it in the mail tomorrow. Thanks for participating! I prefer picturing the character myself. Oftentimes when a book is made into a movie, the character I picture is not the same as cast in the movie. I understand the author needs that picture in his/her head. They have to find inspiration and of course I have no problem with that. Everyone’s idea of beautiful or handsome is different. For example, seems like everyone these days thinks Channing Tatum is just the hottest thing and I personally don’t. Yes he’s good looking but not enough for me to fan girl over. I would love to read this book. If I don’t win. I may have to download on my kindle anyway! Hi Nicole, thanks for stopping by. I can totally see what you are saying. A few times my personal thoughts were very different when I saw a character picture. Pretty much every writer has a character picture in place while writing, it helps keeps the descriptions consistent, but maybe sharing those pictures isn’t always helpful for the reader. Thanks for commenting! I hope you visit again. I have entered your name in the drawing. If you don’t win, then I hope you will consider downloading it. I’m looking forward to book 2! Oh – so with you on Channing Tantum – I don’t get it. At all. I like putting a face to a character to see if what I have imagined comes close to what the author was thinking. It’s like that when books I’ve read are made into movies. Some of the Harry Potter characters – Professor McGonagall especially, hit the nail right on the head. Others, like Hermione, weren’t as I pictured, but she was too perfect for me to mind. And YES, I want to win this book! Go Fantasy!!! Woot-woot. Hi Lisa, I’m with you. I love putting characters and pictures together. That is probably because we are writers and think alike. I bet you will love this book, it’s a great combination of YA fantasy and romance. I’m throwing your name into the drawing. Good luck! SO true – sometimes movie characters don’t fit at all – and then sometimes they’re not what I pictured (like Peeta) but they end up working well (like JHutch did for Peeta – now I can’t image anyone else being him). Wow. As a teen reader i read a lot of sci-fi just because it was ‘out there’ and time travel is pretty out there too! As far as how an author envisions the characters in their writing, if it works then go ahead. :-) In order to write someone elses story it helps to have that ‘minds eye’ and watch the characters move and react. The reader need not know which picture used by an author but a casting director might want to in order to cast the right person for the movie! So, do tell…did you ask about a sequel to Saving Yesterday? Hi Nancy, thanks for stopping by. I entered you in the drawing! I did ask about a sequel… seconds within finishing the book. 😉 I am happy to report that book 2 is due out by the end of the year. I can’t wait! 🙂 Always nice to know when chacters get to live on! My life has been hectic lately and I missed the announcement….but got a package in the mail! What a great surprize in my week. With my college daughter on spring break she might read it first. Thanks so much for sharing your writing. Now we just have to wait for YOUR book!!!! YEAH! Glad you won! You’ll have to let me know what you think. Hi Kim, I love the term “fangirl”. First I have heard of it, too! I think your girls would love this book. Thanks for stopping by. I have entered your name. Fangirlians unite! Hey, with fellow fangirls is my favorite place to be!